Four Oaks Legal Services were once again shortlisted in the Business Networking Awards in the category “Professional Business of the Year”, along with a number of other prestigious local companies. The Business Networking Awards takes place each year and brings together businesses from Sutton Coldfield, Tamworth and Lichfield. The event took place this year at Drayton Manor on Saturday 7th April. 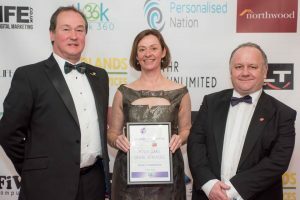 Four Oaks Legal Services were delighted for the second year running to be the only business in their category to be awarded a”Highly Commended” status. Director Stuart McIntosh and Solicitor Joanna Parkin attended the entertaining evening celebrating the success of local businesses. Four Oaks Legal Services would like to thank everyone involved with the Business Networking Awards for all their hard work and congratulate all those who were recognised on the evening.